Astronaut Janice Voss, who died Feb. 6, 2012, at age 55, is pictured on the flight deck of the space shuttle Endeavour during the STS-99 mission in 2000. Astronaut Janice Voss, a veteran of five spaceflights and a former science director for a NASA exoplanet-hunting spacecraft, has died after a battle with cancer. She was 55. "Just got the very sad news that U.S. astronaut Janice Voss passed away last night," the Association of Space Explorers, an international organization representing more than 350 individuals who have flown in space, wrote on Facebook. "Our thoughts go out to her family and friends." NASA confirmed Voss' death in a statement issued on Tuesday (Feb. 7), saying she had passed away overnight. Chosen by NASA for the astronaut corps in January 1990, Voss served as mission specialist on five space shuttle missions, including the only repeat flight in the shuttle program's 30-year history. She flew with the first commercial laboratory, rendezvoused with Russia's Mir space station and helped create the most complete digital topographic map of the Earth. Astronaut Janice Voss, mission specialist of the STS-99 space shuttle mission. 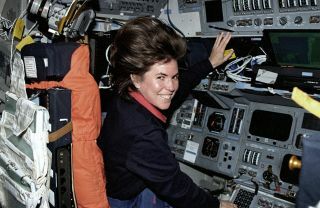 Voss launched on her first and final missions aboard the shuttle Endeavour. As a member of the STS-57 crew in June 1993, she helped conduct biomedical and material science experiments in the first commercially-developed Spacehab module, a pressurized laboratory mounted in the orbiter's payload bay that more than doubled the work area for astronaut-tended activities. Voss' second flight to space marked the first time a space shuttle came within the vicinity of Russia's space station Mir. Flying on the shuttle Discovery, Voss and her STS-63 crewmates — including Eileen Collins, the first woman to pilot a U.S. spacecraft — rendezvoused with the Russian outpost to verify flight techniques, communications, and navigation and sensor aids. The February 1995 "Near-Mir" mission set the stage for the first shuttle-Mir docking later that year. Voss' two other spaceflights, STS-83 and STS-94, were the only time in the shuttle program's history that an entire crew was launched twice to achieve the same mission. The crew's first attempt began with a liftoff on Columbia on April 4, 1997. Three days into the mission however, a problem with one of the orbiter's three power-generating fuel cells resulted in the flight being cut short and the crew members returning to Earth. Three months later with Columbia back in working order, Voss and her six STS-83 crewmates launched again, this time as the STS-94 crew. During the successful 15-day flight, Voss and her fellow fliers worked inside a European Spacelab module, conducting experiments as part of the Microgravity Science Laboratory (MSL) mission. In total, Voss logged over 49 days in space, traveling 18.8 million miles (30.3 million km) while circling the Earth 779 times. Her five missions tied her with the record for the most spaceflights by a woman. Four years after returning to Earth for a final time, Voss transferred from Johnson Space Center in Houston, Texas, to NASA's Ames Research Center at Moffett Field, Calif., where she headed the science program for the agency's Kepler space observatory. Designed to search for Earth size planets orbiting distant stars, Kepler was launched in March 2009 and to date has confirmed 61 exoplanets and identified more than 2,000 planetary candidates. Voss left Ames in 2007 and most recently served as the payload lead in the astronaut office's space station branch at the Johnson Space Center. "As the payload commander of two space shuttle missions, Janice was responsible for paving the way for experiments that we now perform on a daily basis on the International Space Station," chief astronaut Peggy Whitson said in the NASA statement. "By improving the way scientists are able to analyze their data, and establishing the experimental methods and hardware necessary to perform these unique experiments, Janice and her crew ensured that our space station would be the site of discoveries that we haven't even imagined." "During the last few years, Janice continued to lead our office's efforts to provide the best possible procedures to crews operating experiments on the station today," she said. "Even more than Janice's professional contributions, we will miss her positive outlook on the world and her determination to make all things better." Janice Voss, a scientist who worked on Kepler, studies a field plate, or identifier. A native of Rockford, Ill., Voss received her bachelor of science in engineering science from Purdue University in 1975, a master of science degree in electrical engineering and a doctorate in aeronautics and astronautics from the Massachusetts Institute of Technology in 1977 and 1987, respectively. Voss' first work with NASA was during her undergraduate studies at Purdue. A member of Johnson Space Center's co-op program, she worked on computer simulations in the engineering and development directorate in the years leading up to the start of the shuttle-era. Voss returned to the Johnson in 1977 for a year, working as a crew trainer teaching entry guidance and navigation. Before becoming an astronaut, Voss worked at the Orbital Sciences Corporation, supporting mission integration and flight operations for the Transfer Orbit Stage that launched the Advanced Communications Technology Satellite from the space shuttle in September 1993, and NASA's ill-fated Mars Observer from a Titan rocket in 1992. A multiple recipient of NASA's Space Flight Medal, Voss donated her personal papers documenting her spaceflight career to Purdue Libraries' division of archives and special collections in 2009. "Knowing that someone else got from here to there brightened many of my days at Purdue," Voss said at the time, referring to the university's earlier astronaut alums. "Maybe my papers will help someone else feel that they aren't that different from me." "If I can do it, then so can they," Voss said.